The first time that we decided to stay downtown we chose the Plaza. Others told us that some of the downtown hotel/casinos were charging less than the hotels on the strip. 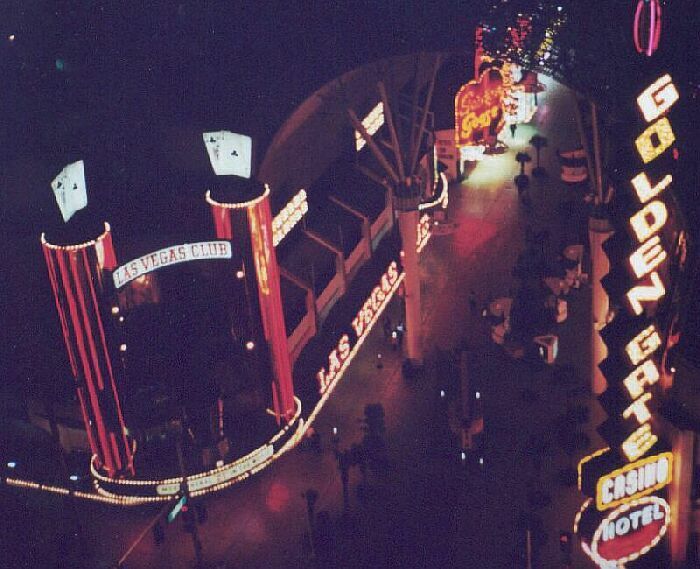 We have been staying at the Plaza every year since. First we stayed in the South tower. It is newer than the North Tower. 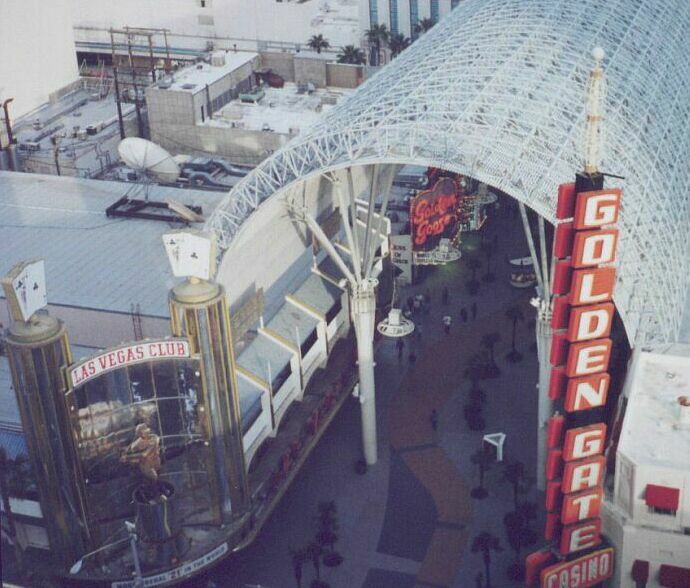 But after we tried the North Tower, we always ask for a room there, preferably facing Fremont Street. If you plan to stay facing Fremont, be prepared for the hourly Fremont Street Experience show. The shows start at dusk and continue on the hour till midnight. In January (2002) we stayed in a minisuite (photo above). 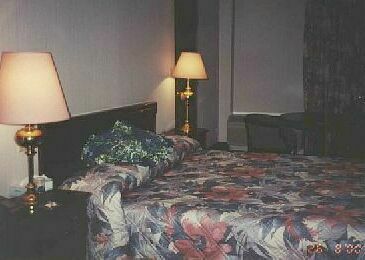 It was not the nicest room that we've had there, but it was clean and comfortable. There was a balcony so we could go out and watch the "light show" or just watch the people. 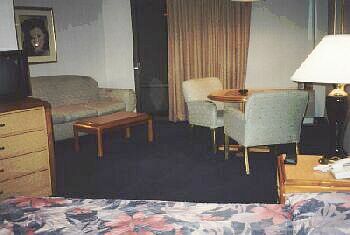 The room had a small fridge, desk, couch, coffee table, end table, floor lamp and the usual furnishings. A few years ago we had a lovely minisuite which must have been recently redecorated. 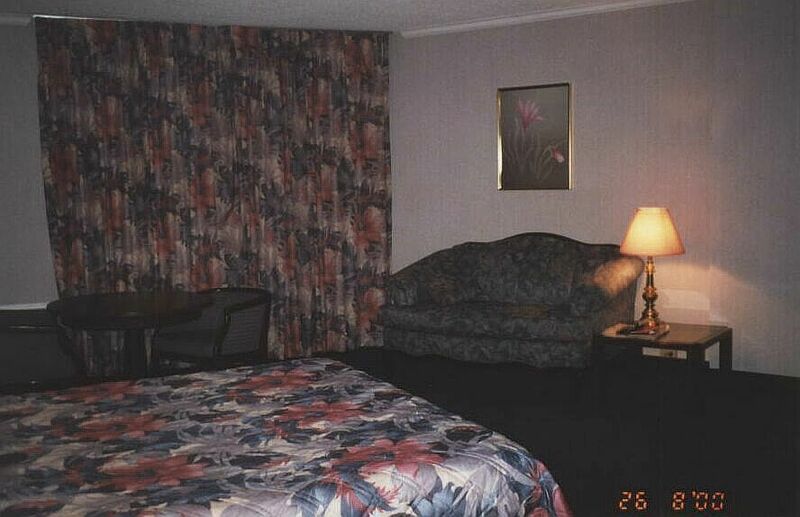 It was a large room with a king-size bed, a sofa, two arm chairs, end tables with lamps, a coffee table, and table with chairs that matched the sofa/arm chairs. I wish I would have had my camera. You never know what kind of room you are getting at the Plaza. You are usually given a room with two beds (queens). We stay there everyyear and have had many different floor plans. 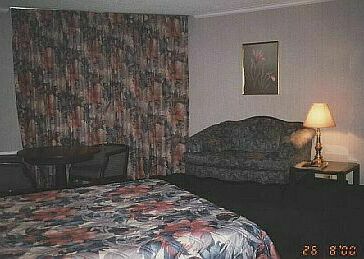 It is an old hotel, so we don't expect the kind of rooms that the newer hotels on the Strip have. We are also not paying the high rates that the Strip hotels are asking for their rooms.